Traj Infotech: The Digital Marketing Trends to look for in the year 2018. The Digital Marketing Trends to look for in the year 2018. We are already in the month of December, end of 2017 and start of 2018. Every business should be ready with a marketing strategy for the New Year. 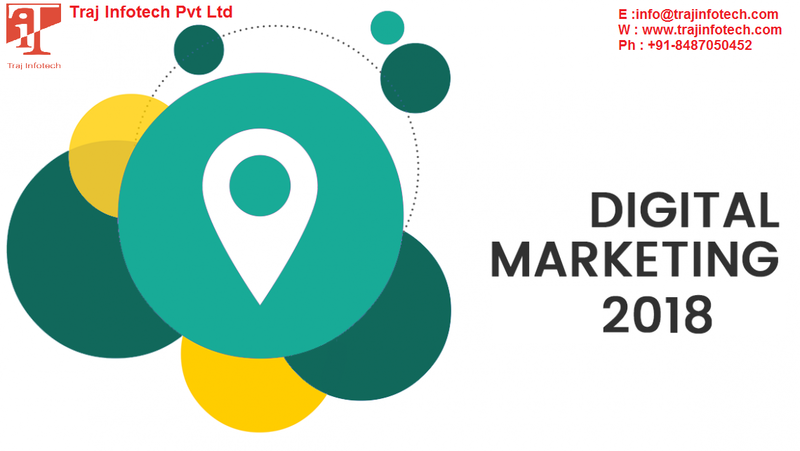 Let’s kick start with some digitalmarketing trends for 2018. These are general marketing predictions that can affect your business in many ways. In 2018, we expect to see these different types of digital marketing trends. Artificial Intelligence has been around for some time now companies have started using Artificial Intelligence for marketing. Changes or improvement in technology will lead to the growth of Artificial Intelligence. Live video is a fast growing trend. These days, people enjoy watching videos rather than reading a blog. Through live videos you can show an event, holiday, sales or advertise a promotion or use it to introduce a new product. All should make sure their website is mobile friendly because people spend most of their time on smart phones. There is a lot of scope for growth for mobile videos in 2018. So, plan a mobile video strategy to be ahead of your competitors. User experience is very vital. Most customers will look at your brand on the basis of their experience with your company. A great user experience will help in brand loyalty. Content marketing is becoming popular and is available in different forms like videos, infographics and blogs. Voice search can be used anywhere, laptop, phone, desktop, etc. Since, television has started using the digital platform; most companies prefer YouTube and social media for advertisements rather than advertisements on television channels. In 2018, companies will focus on Generation Z marketing; these customers will stay for many years. Customers are looking for trust and transparency. If you want to be rewarded, be transparent with your customers.